Porter Hopkins, an eighty-three-year-old Korean War veteran and former Maryland legislator, invited five Marines to his farm in Cambridge, Maryland. Dove hunting season began on September 1, but Mr. Hopkins reserved his land and deferred the shooting to offer his guests the first opportunity to hunt. 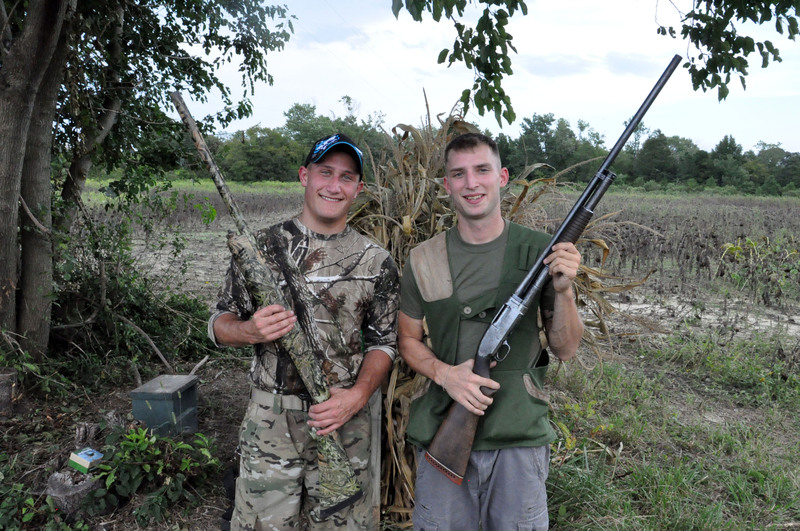 Two Marines from Pennsylvania, Mark and Ryan, came out to the farm. 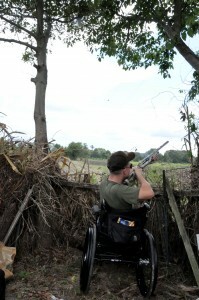 Mark, an infantry Marine, was wounded by an IED during his first week in Afghanistan. In order to save his life, the medics amputated both his legs at the hip. Shortly after his injury, Mark and his family were visited by Colonel Oliver North and the Freedom Alliance team while he recuperated at Walter Reed. In spite of the intense narcotics to help manage his pain, Mark remembers that visit. Ryan was serving in Afghanistan with the Third Battalion, Ninth Marines (known as “The Walking Dead” regiment in Vietnam) when he was hit by an RPK machine-gun round. The bullet ripped through his side, damaging Ryan’s bladder and other internal organs, and exiting his left thigh. He’s undergone several surgeries and is awaiting an invasive operation to repair his bladder. Daniel Hall, a Marine sniper, was involved in an IED blast while on foot patrol in Afghanistan. The IED wasn’t rigged correctly and only partially exploded; Daniel’s legs suffered damage, and yet he survived. Daniel used his sniper skills in the mid-field blind, while Mark and Ryan shot from opposite sides of the field in the ground blind. Two staff members of the Walter Reed WWBn-E (Wounded Warrior Battalion-East) detachment, Josh and “Gunny” Louis, came along as well. A native of Oregon, Josh is a highly regarded staff sergeant with the Marines he cares for at Walter Reed. Due to manpower cuts, he is being forced out of the Corps, despite petitions from his patients, and thus, this was his last event with Freedom Alliance. Four hours and 400 spent shells later, we cleaned up and hid the rest of the ammo from trigger-happy Mark so we could eat dinner. Mr. Hopkins and his volunteers cooked dove and served venison chili, afterwards asking the Marines to come again for goose season.